Ask fellow campers about "Bucksport / Fort Knox KOA" and nearby attractions. Nice park. Nice owner who went out of her way to make our trip a good one. Tight spaces hard to back into spots. Looks like majority of park is seasonal. Extremely quiet and relaxing. We were there late so many activities were no longer active. We camped at Bucksport / Fort Knox KOA in a Travel Trailer. This was our third time camping at Shady Oaks. It's comfortable, well run and the wi-fi is phenomenal! We camped at Bucksport / Fort Knox KOA in a Motorhome. Rate above is monthly rate divided by 30. Excellent value for Maine in the season. We rented a back-in 50A site for a month (August) for $600 plus electric. Site is gravel but does have a small concrete pad with picnic table. Access to the park is by security gate, we were given a remote upon check-in, deposit $20. Small laundry, wifi is available, as is cable, which we didn't use as we have satellite. Owners friendly and accomodating. Nice pool, rec room with some organized activities. There are several nice rental cabins tucked into the woods. No trash pickup, take it to the dumpster. Lots of seasonal campers, some who live close by. Campers range from motorcycle tenters to diesel pushers. We camped at Bucksport / Fort Knox KOA in a Motorhome. two miles from town, with a grocery store. 15 miles from next large town. Very neat and clean park. It was quiet and there was very little road noise. Watch out for the turn into the park from Rt.1 as you will turn onto Rt. 166 and not Rt. 175 as the State as renumbered the road. We would stay here again when visiting this part of Maine. We camped at Bucksport / Fort Knox KOA in a Fifth Wheel. Lovely campground, spacious, wooded, clean, quiet, and well maintained. Very friendly and helpful owners. We camped at Bucksport / Fort Knox KOA in a Motorhome. Extremely friendly and accommodating owners. Convenient to town, shopping and attractions. New area easily accept big motorhomes and 5th wheels. Owners have pancake breakfasts on Sundays and banana split nights for guests. This park is a keeper. We camped at Bucksport / Fort Knox KOA in a Travel Trailer. This is a little gem of a park which is located near Bucksport, which makes for an easy day trip to Bar Harbor. We're in the newest section which gives us a strong satellite signal since it's a little more open than the other parts of the campground. Parking space is on gravel with a concrete patio with a picnic bench. We have good 50 amp power, strong water pressure, and sewer hookups that are where they should be. Bathrooms are clean, pool is spotless, and the owners being Rvers themselves know what they're doing. They have pancake breakfasts and potlucks, along with other activities that are posted on the bulletin board. We're in a 40' motorhome and it's a little tight getting to our spot. So would recommend disconnecting your towed at the entrance. Our nightly rate is for a monthly stay, one of the best we've seen in Maine. When back in lobstah country, we'll definitely stay here again. We camped at Bucksport / Fort Knox KOA in a Motorhome. This is a wonderful place to have as a base location for the area. The owners are super friendly and helpful. The upper sections are mostly seasonal but the lower area has pull through 50 amps and full hook ups. The park is extremely clean and neat. There is very little shade in the lower area, but spacing is more than ample. The Wi-Fi was marginal. We would definitely stay here again. We camped at Bucksport / Fort Knox KOA in a Motorhome. Dogs are not allowed. 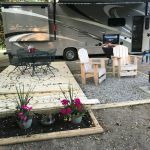 Everything in and around this campground is clean and well kept. They are most accommodating owner/operators we've encountered. There were well planned activities. The pool is spotless. The new laundry in lower section is a welcome addition. There are three sections. The oldest (upper) has small sites but trees, grass and paved road. The middle section is gravel with less shade; and more seasonal visitors. The newest (lower) site is still being developed and is more big rig friendly. Our rate reflects an unplanned extended stay which was accommodated graciously by management. We would LOVE to stay here again! We camped at Bucksport / Fort Knox KOA in a Motorhome. This park's proximity to Acadia National Park and other areas of interest make it well located for Maine sightseeing. The entrance and interior roads are very narrow, and the campground gives the appearance of having motorhomes, 5th wheels, campers, tents etc. fitted into every nook and cranny. However, the new area under development will easily accommodate big rigs, but getting to the area requires negotiating a winding, narrow road. Much of the campground, including the new area, is open enough to permit use of rooftop mounted satellite dishes. The owner / managers are exceedingly gracious and helpful. The price is reasonable for the area ($30 per night for 30 amp, $32 per night for 50 amp). Overall, the park is well-maintained, but it is an older park, so facilities like laundry and showers are limited. We would definitely stay here again. We camped at Bucksport / Fort Knox KOA in a Motorhome. 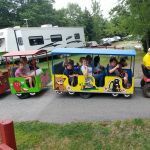 This campground is a reasonably priced campground located within 30 miles of Bar Harbor. It is well maintained; however, there is a newly leveled and graveled open area for big rig overnighters that still needs work and equipment cleanup. The new area has full 30/50 amp hookups and is great for short stays in an otherwise high cost area. 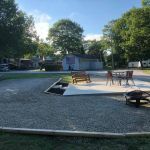 The older shady area of the campground has quite a few seasonal and smaller RV units catering to family oriented camping. The swimming pool is clean and well maintained. The laundry facility only has 2 washers and dryers and the campground could use another laundry room dedicated to the lower separated big rig area. Overall it is a great little campground well within traveling distance of Bar Harbor. We would stay here again. 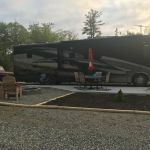 We camped at Bucksport / Fort Knox KOA in a Fifth Wheel. This campground is very small, and it's more like a retirement community. We camped at Bucksport / Fort Knox KOA in a Motorhome. 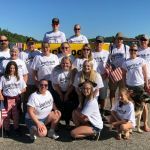 Are you affiliated with Bucksport / Fort Knox KOA ?